Terrence Orr, MD, is a board-certified orthopedic surgeon. He received his Doctor of Medicine from the Medical College of Wisconsin. An internship followed at Northwestern Memorial Hospital, with a residency at Washington University in St. Louis, MO. He also has published work in the Orthopedic Review and the Journal of Pediatric Orthopedics. From 1984-1987, Dr. Orr practiced with Orthopedic Associates in Arlington Heights, IL, in affiliation with Northwest Community Hospital. 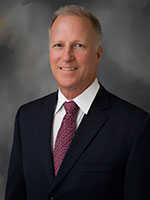 In 1988, Dr. Orr moved to Lake Tahoe to complete his Sports Medicine Fellowship with Tahoe Fracture Orthopedic Clinic where he practiced from 1988-2009. Dr. Orr raised four children in South Lake Tahoe with his wife who has a PhD in Anatomy and teaches at the local college. Dr. Orr is the head physician for the Men’s U.S. Alpine Ski Team. Since 1988 he has been a team physician for the U.S. Ski Team before becoming the head physician in 2000. In addition to being a member of the medical staff for the Winter Olympic Games in 2002 and 2006, and providing coverage of international ski competitions such as the Alpine Skiing World Cup Finals and the World Alpine Skiing Championships, Dr. Orr has provided medical treatment for other outdoor sports such as the World’s Toughest Triathlon, the Death Ride, the Lake Tahoe Marathon and local high school and college sports programs. Dr. Orr enjoys snow skiing, water skiing, hockey, golf and biking.